The Search for Catbug was released in two editions. There was the Convention Exclusive which you could have grabbed from the Viz Media booth at San Diego Comic Con 2014 (like I did) or the standard edition that can be purchased from anywhere. The two editions are almost identical. The only difference between the convention exclusive is the dust cover – literally! Once you remove the jacket, the ISBNs on the back of the book are the same. So if you didn’t pick up an exclusive copy from a convention booth, don’t worry because you’re not missing out on any real bonus content except for a fancy cover. 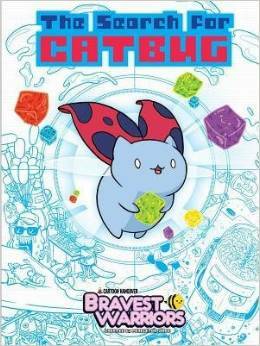 This book is targeted towards young fans of the Bravest Warriors series but I think people of all ages could have fun with The Search for Catbug. I for one picked up my convention exclusive copy because I loved the artwork. Growing up, I always checked out the Where’s Waldo? books from the school library. I enjoyed the challenge of finding Waldo in a sea of lookalikes. 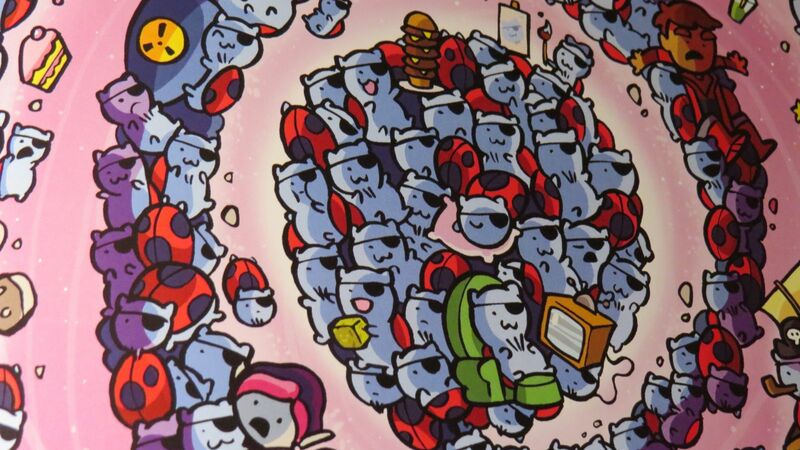 In the case of The Search for Catbug, you’re basically in a really glam Where’s Waldo. Flip the book open to any page and you’re looking at a beautiful two-page spread of art and somewhere in the illustration Catbug is hiding. I have to admit, I still haven’t found Catbug in some of the scenes so I wonder how long 7 year old me would spend searching for Catbug before throwing the book onto the floor. I can certainly say that I am spending most of my time looking at the beautiful assortment of colors and images on each page. This book prompted me to take a peek at my beloved Where’s Waldo spreads and I realize in comparison, Waldo has really aged. The colors are so bland compared to the gorgeous hues in The Search for Catbug. Keep in mind the only reason I am comparing this to Waldo’s world is because I think it hits the same audience. I’m not knocking Waldo, I’m just saying he needs to start exploring some more colorful, Adventure Time-esque worlds to stay relevant. The back of The Search for Catbug features a key for each illustration revealing the location of Catbug. It also gives credit to the talented folks who created each work. I suggest avoiding the back of the book until you are absolutely certain that you cannot find Catbug. Yes, some of the drawings are much more difficult than others and you will pull your hair out looking for Catbug but nobody likes a quitter! I will note that my review copy had an imperfection in the end paper. Underneath the paper and between the hard cover is some sort of bump which could be a chunk of dried glue. It’s nothing to be concerned about and I am confident that it’s probably a defect that is exclusive to my review copy since my copy from SDCC2014 does not have any imperfections. Title: Bravest Warriors: Things to Doodle and Do! Things to Doodle and Do! 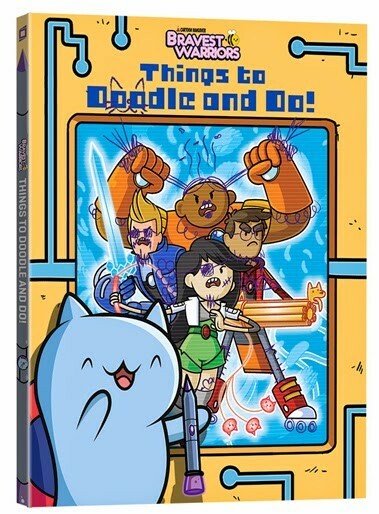 is a cute, non-traditional activity book focusing on the gang from Bravest Warriors. This can easily be mistaken for a coloring book since you technically could color in the lines on every page; however, some of the pages are coloring pages and others are activities that vary from filling in speech bubbles to designing a mask for Wallow Libre. There are a few activities from the book that caught my attention. 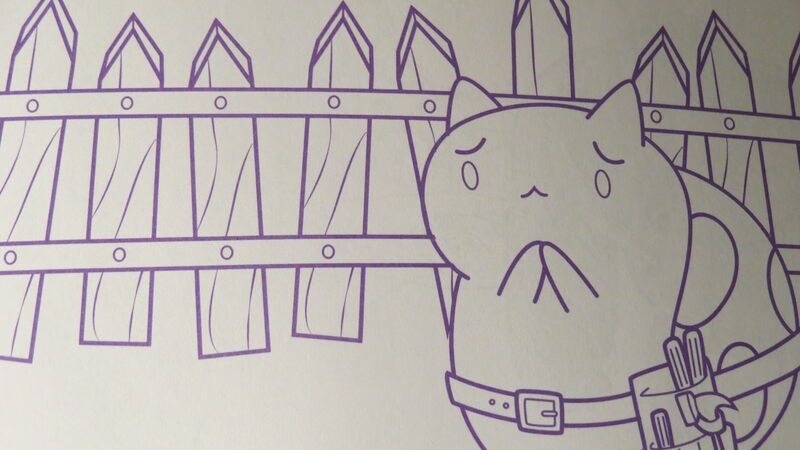 Towards the front of the book is a two page spread with a fence along the boarder and Catbug towards the bottom of the page. It states, “Catbug made a fence. What’s in it?” Kids can go crazy here and draw farm animals, aliens, kittens, or anything else they want. Further into the activity book is a comic strip, “First Sparkles.” Based upon the images you can create a dialogue using the speech bubbles and then you can color the illustrations in to bring it to life. Catbug built a fence! What’s in it? If you have friends with you, there is a game in the center of the book. Two pages make up the game board and then there are pieces to cut out and instructions. You can really tell that some creative people brainstormed to create this activity book. I don’t remember activity books in my childhood containing comic strips, games, and things to color in. I was stuck with boring mazes and word search puzzles. Both of these books are great for young readers and are a must if you’re on a long road trip with a couple of restless children. Adults may not be interested in Things to Doodle and Do! but I definitely suggest that people of all ages can enjoy The Search for Catbug. Even if you’re not too invested in finding Catbug, the illustrations have wonderful color schemes that are enjoyable to look at. **These items were provided for review.